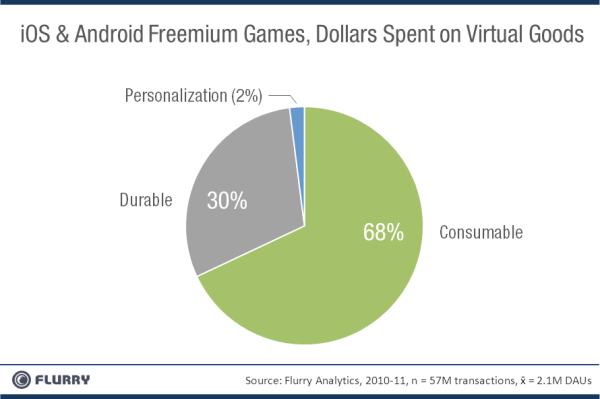 After analyzing a data set of over 57 million purchases across both the Android and iOS platforms, analytics firm Flurry discovered that mobile gamers appear to be spending the majority of their money on “consumable” virtual goods. That is, virtual goods that are depleted when used, like a a set of grenades in a war game, or a fertilizer that helps crops grow faster in a farming game. Less popular are durable goods (those that offer a permanent benefit) or “personalization items,” which are purely decorative upgrades. In-app purchases have recently shifted to to become a major revenue generator in mobile gaming, says Flurry, now accounting for 65% of all revenue in the top 100 freemium games. Right now, for example, the top 5 titles in the iTunes App Store’s “Top Grossing” category are freemium games, and 22 of the 25 “Top Grossing” apps are games. For developers, in-app purchases are a leading method for generating income. But it’s a broad category. An app’s users can purchases upgrades, add-ons, virtual goods, in-game currency, and other items to enhance their game play. What’s interesting here, is that one type of in-app purchase is by far the most popular: “premium” in-game currency. This currency can be used to accelerate through a game, or purchase in-game items not available to non-paying users. 68% of gamers spent that money on “consumable” items (items that deplete when used), while just 30% buy “durable” goods. These durable items may include things like better armor in role-playing games, or a building in a city simulation. Flurry notes that it’s important for a game to offer both kinds of items, however, because durable goods can give gamers a sense of progress, and allow them to set goals by saving up for big purchases. Meanwhile, only a small percentage (2%) of gamers buy personalization items, likely because such items don’t affect gameplay. Unless a game is largely about personalization, there’s no need to keep a large selection of these types of items on hand, Flurry suggests. The sample size used in this study comes from over a year’s worth of data, including over 57 million purchase transactions across a set of freemium iOS and Android games that averaged over 2 million daily active users. That said, the selection of games examined are only those using Flurry’s analytics service.